Some people love going to the mall to shop shoes, clothes, Pottery Barn — whatever. My favorite thing about mall shopping is a trip to the Barnes and Noble kids section to see what's new in picture books — or at least what's new on display. On my most recent visit, there were so many gems I'd never seen before that I knew I had to spread the word — and also give a shout out to some of my faves that have already been around for a number of years. These books each boast either a sweet little lesson or gorgeous illustrations — usually both. I'm a sucker for illustrations! Now granted, I don't have kids nor do I see my friends' kids in action enough to know which books are truly a hit. I just know what speaks to me and what (I hope!) a child would also treasure. Moms of the world, I'd love to hear what books your kiddos can't get enough of! Feel free to share your favorites in the comments. 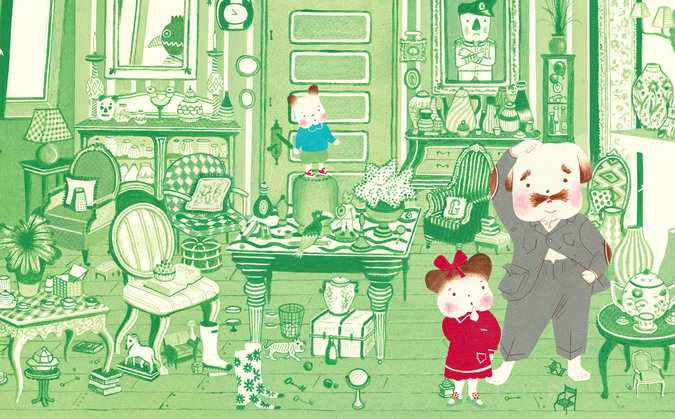 This one's less about the story and more about the illustrations, which create their own sort of I Spy game. The premise: The kids want to go to the park with Grandad, but can't leave until they find his glasses, umbrella, and even his teeth! It's up to you to find what Grandad's missing in each cunningly-illustrated spread. 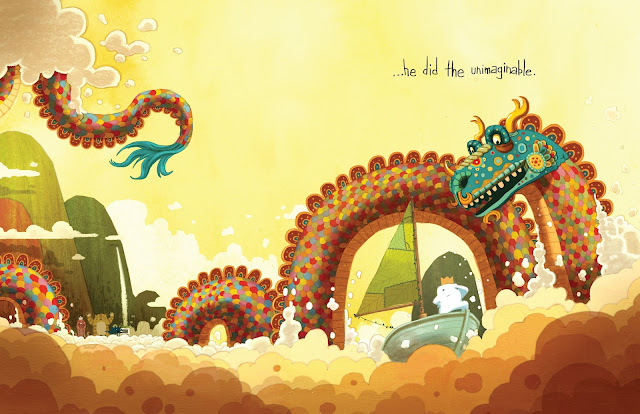 On the sunshine, gumdrop, and candy-colored island of imaginary friends, Beekle waits to be imagined. But no little ones are dreaming of Beekles, so our brave hero sets out in search of a child to befriend. As you might guess, this story has a happy ending — and pictures that will give you lots of happy feels! Journey is for all ages, truly. 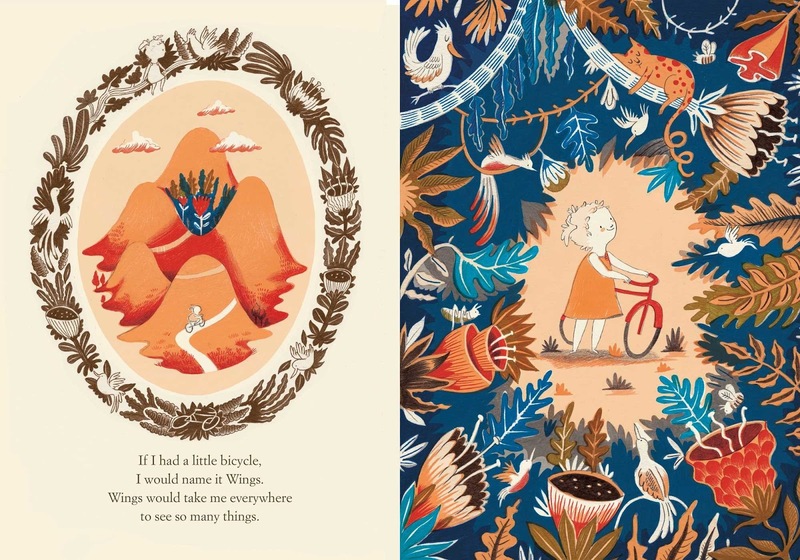 There are no words, simply gorgeous illustrations. On one hand, you could "read" this story to a child, inventing words as you go along and leaving room for a new adventure with each retelling. On the other hand, any adult would appreciate Journey as a work of illustrative art. This charming book really stole my heart — to the point where I bought it with no intention of giving it to anyone. The little rhyming stanzas throughout are darling, as is the grateful message, but the drawings are what sunk me. The illustrations harken back to Scandinavian folk art and are rendered in the same simple color palette, allowing the whimsical forms to shine. As I was writing this, more books popped into my mind that I must share — too many for one post. Stay tuned for a Part Two coming soon! And in the mean time, don't forget to tell me some of your favorite picture books in the comments. Milwaukee Opera Theatre presents "The Mikado"
Hilarious, wild & wondrous — catch it while you can! Our city is abuzz about the Milwaukee Opera Theatre's The Mikado, and now I know why. It was industry night on Monday, and the intimate Next Act Theatre was packed with theatrical types. Paper lanterns swayed overhead and the "orchestra" lay in wait, illuminated against a pitch black stage. I went blindly into the Gilbert & Sullivan classic (I'm an opera novice), but some tunes rang strangely familiar. I later found out all those Frasier re-runs are to thank. The Mikado is a comic drama from 1885 that tells the story of Nanki-Poo who loves Yum-Yum, who is supposed to marry Ko-Ko. Nanki-Poo is believed to be just a poor Second Trombone in a traveling show, but he's in fact the only son and heir to the Mikado's throne. It's one of those stories that's complex in a Shakespearean way: Secret identities, scorned ex-lovers, sometimes-clever deceptions, and the occasional threat of beheading. The characters are equally madcap. There's the aforementioned Nanki-Poo, Yum-Yum, and Ko-Ko (the city of Titipu's Lord High Executioner), Pooh-Bah (Titipu's Lord High Everything Else), Katisha (the ex; rather psychotic & plain-faced), and The Mikado himself. Oh, and FYI: The original staging and story take place in Japan, which nowadays makes you squirm in a "these caricatures aren't PC" way. 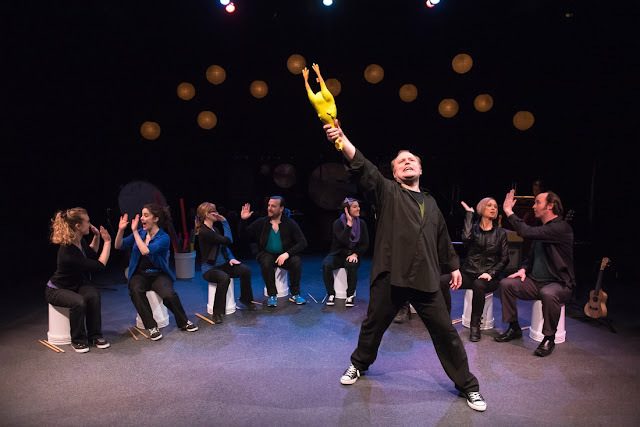 But what makes the Milwaukee Opera Theatre's production of The Mikado so very special is how they trade Japan for a vague, fanciful setting, thereby avoiding any touchy subjects in favor of fun. For my part, names like Nanki-Poo and Yum-Yum might as well have been elves or oompah loompahs. I didn't read into it, rather gladly accepted the whimsical nomenclature at face value. It was easy to do, since the staging of this Mikado invites you to check your adulting tendencies at the door and revel in an evening of laughter and silliness. That "orchestra" I mentioned earlier? It's actually an ingenious lineup of percussion instruments. Thanks to the private collection of Michael Lorenz, percussionist at Skylight Music Theatre, and the creative vision of Artistic Director Jill Anna Ponasik, the 11-piece vocal ensemble plays all of the instruments throughout the show themselves. There are tiny toy pianos, three gongs, washboards, finger cymbals, things that go "whiz!" and "whomp," plastic tubes in different tones, simple buckets and sticks, and even a squawking rubber chicken. And let's not forget the greatest instrument of all: the marvelous voices! This same troupe of eleven originated the Milwaukee Opera Theatre's Mikado two years ago to rave reviews, and all the same near-flawless talent is back. Susan Wiedmeyer as Yum-Yum certainly cast a spell with her lovely songbird's ballad "The Sun Whose Rays Are All Ablaze." Diane Lane's leather-clad Katisha had the audience in stitches with her cougar-esque take on the vengeful lover. As for the primary men in the ensemble, it's tough to pick a star. Nathan Wesselowski as Nanki-Poo oozes easy charisma. Jason Powell and Joseph Riggenbach as Ko-Ko and Pooh-Bah, respectively, are such a hilarious duo, they just might be my favorites — especially Powell. Whether comically holding a note for what felt like a good 30 seconds or brandishing a rubber chicken, it was a blast to just sit back and laugh. Laugh, and relish the unbeatable talent. After the standing ovation on Monday night, as my theater buddy and I walked back to our cars, I asked her what she thought. "Wasn't what I was expecting!" she laughed. It was her first opera. "I always thought the opera was dramatic. Starting with a comedy was actually a great way to go." I couldn't agree more. Sure this was only my second opera ever (and I was lucky that my first was Milwaukee Opera Theatre's Zie Magic Flute! ), but I must say that if you're ever going to get your operatic feet wet, now is absolutely the time. 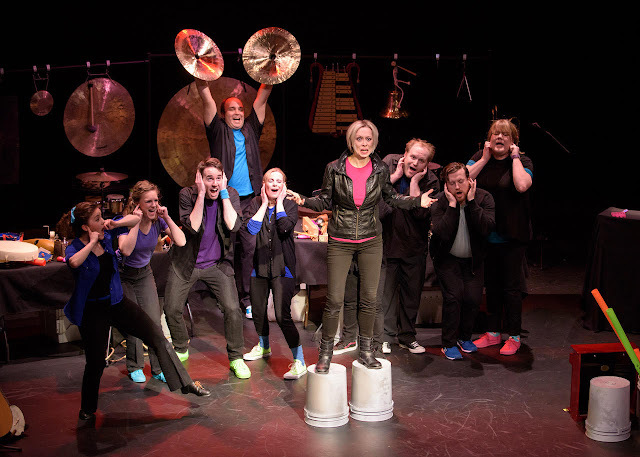 The Mikado is playing this Thursday through Sunday at the Next Act Theatre. Information and tickets at milwaukeeoperatheatre.org. Dinner and drinks with girlfriends is really the best. Hate to break it to you boyfriends of the world, but when you can go and gab for hours, share plates, and sip wine with your girls, it's a win. That means finding a place that doesn't mind if you hunker down. It also means finding a spot with dishes to share, because I think women are genetically built to want to try a little of everything — that's why eating with fellow womenfolk is such a delight. For our most recent night out, the girls and I finally tried Black Sheep in Milwaukee's Walker's Point. The place has been around since 2013, but the buzz is still going strong; there was almost a two-hour wait, but luckily no line at the bar. We sat for a long time, noshing and catching up — never feeling rushed. If anything, the bartender that night was notably gracious. For drinks, you can choose from the wine bar, house-made sangria (which looked delish), bottle and tap beer, spiked tea, and craft cocktails. For food, Black Sheep offers a variety of plate sizes. There are Bar Snacks (truffle popcorn, soft pretzels, pancake-battered cheese curds) as well as dishes To Start (tempura veggies, a waffle topped with goat cheese, candied bacon & maple syrup), To Share (poutine, fried chicken, crab cakes), To Feast (steak frites, fish fry, roast salmon), and To Finish. Black Sheep is located just across the street from Purple Door ice cream, so let's just say the treats To Finish are made with the finest local ingredients. What dishes did we try? Bacon-wrapped, goat cheese-stuffed dates as a starter, followed by gnocchi with peas, sweet potato, parmesan, and garlic — both tasty. Then, to feast, we went for the Cauliflower Brava (spiced cauliflower, roasted pepper, pea shoots & radish) and the Black Sheep Burger. The cauliflower was good, but we found the burger to be rather basic. Solid, but not particularly inspired. I'd love to go back and try a whole new lineup of savory goodness. But what really put me over the edge and guaranteed a return trip to Black Sheep: The Spiked Shake. Get this. Purple Door salted caramel ice cream with Jameson Irish Whiskey. Salted caramel ice cream from Purple Door is my favorite, period. In shake form? Spiked? Heaven. It might be a $10 investment, but please — take my money! Scandinavian-style home décor and design is a bit of a puzzlement to me. It calls to mind clean lines and a certain unfussy-ness, while still managing a cozy feeling. Maybe it's that such design is all about simplicity, and there's something comforting about that less-is-more aesthetic. In these days of Marie Kondo, the Scandinavian interior philosophy (should you choose to embrace it) inherently gives your world some much-welcomed room to breathe. I don't personally subscribe to less is more. You should see my apartment! But even I can find some choice pieces to add to my eclectic interior vibe at a shop so expertly curated as Olson House in Shorewood. Boasting "thoughtful interiors" and "consciously crafted products," the store is located just up the street from me (a stop at North Shore Boulangerie followed by a trip to Olson House is a delightful way to spend a Saturday or Sunday morning). Olson House is the brain child of Teresa Olson, an interior designer and proud Scandinavian. Her shop offers a myriad of lifestyle goodies: modern furniture and light fixtures, brightly-patterned pillows, gorgeous wool throw blankets, printed table linens, candles, darling mugs, plates, and vases, handmade plush dolls (that octopus! ), jewelry, chocolate bars, and a carefully-chosen selection of cards. It's a truly marvelous little place! Though the prices tend to fall in line with other shops that sell hand-crafted goods (AKA: often beaucoup bucks), even I never fail to walk away empty handed. Whether it's a greeting card for my stash (one with a bird and a talk bubble that says "chirp") or a folk-y tea towel printed blue birds (again with the birds! ), there's always something I can't say no to. And if I ever need a gift for a special occasion, I know that Olson House will be one of my first stops. The Milwaukee Rep presents "The Glass Menagerie"
I sometimes think I don't deserve my BA in English. Sure I went for Writing, but you'd think I'd still be well versed in famous American playwrights. Alas, no. I couldn't have told you what The Glass Menagerie is about or who wrote it or how very renowned it is as an American masterpiece. While seasoned theater-goers might scoff at how much I've yet to learn, I personally think it was a blessing to go into the Milwaukee Rep's production of The Glass Menagerie (mostly) blind. I've read other reviews comparing one production to another — the actors, the staging, the tone. Free from preconceptions, I was able to thoroughly enjoy everything about this Glass Menagerie without reservations or expectations — which is exactly what I did. For anyone else living under a rock like me, The Glass Menagerie was written by Tennessee Williams and premiered in 1944. It's a five-character memoir play which tells the story of Amanda, a faded southern belle and mother to two grown-up, live-in children: the anxiety-ridden Laura and aspiring poet Tom. The final two characters are Laura's potential suitor, Jim, and the children's father, whose only presence is a portrait looming large in nearly every scene. Each character is a dreamer, longing for a different time, place, or circumstance. Amanda yearns for the past — her golden youth and days when she would entertain 17 suitors in one afternoon. Laura finds herself stuck in the present with no future — just crippling shyness and a gimpy leg, halting all hope of a career or love. Tom aches to get out — out of his mother's house, her expectations, and the responsibility he feels toward Laura as the sole provider. Through this longing, each has their own escape. For Amanda, it's slipping into a frilly old dress that was once en vogue, and the retelling of stories — a far-off look in her eyes. For Tom, his escape is poetry and scheming plans for the future. For Laura, it's her glass menagerie — a tiny crystal kingdom, dazzling and all her own. It's also every bit as delicate and breakable as her family. I imagine with such brilliant writing you'd feel for these characters no matter what, but with Hollis Resnik, Kelsey Brennan, and Ryan Imhoff as Amanda, Laura, and Tom (respectively), this Rep family is one that will have your heart soaring one minute and shattered the next. Resnik is absolutely spellbinding. When she spins tales of days gone by, it's mesmerizing. When she talks a mile a minute, oozing charm and melodrama, it's a hoot. Milwaukee Rep, please bring Hollis Resnik back! I want to see what else she can do. As for the children, I read that some actors play Laura with a shade of defiance — but not Brennan. Her Laura is an utterly dependent, shrinking violet whose plight you really feel for. Imhoff as Tom and the narrator is (I feel) equal parts goon and short fuse, with a dash of sarcasm and a pinch of sincerity. He's certainly fun to watch. Also a quick shout out to the suitor Jim, played by the charming Brandon Dahlquist. Jim shows a more healthy relationship with the past and the future, reveling in his high school glory days, while also investing in his future through night school. It's interesting to see how these characters' woes are entwined with and reflected in each other. Mirrored glass even literally plays a part in the Rep's Glass Menagerie, as the stage is set with two floor-to-ceiling glass walls. Behind wall number one, a large projection of Father's portrait — the reminder of him ever present. Behind wall number two, a dining room table where multiple scenes play out. Given the angle, only two sections of the audience (if that) are able to see beyond this wall. My section of the Quadracci Powerhouse (section 6) had to settle instead for hearing the dining room scenes, like an eavesdropper in the other room. Strangely it still worked for me. There's a moment where Laura sits on the central, always-visible sofa while the others rollick in the dining room. Not seeing the festivities sets your focus acutely on Laura's anxiety and the apartness she feels — a poignant moment. 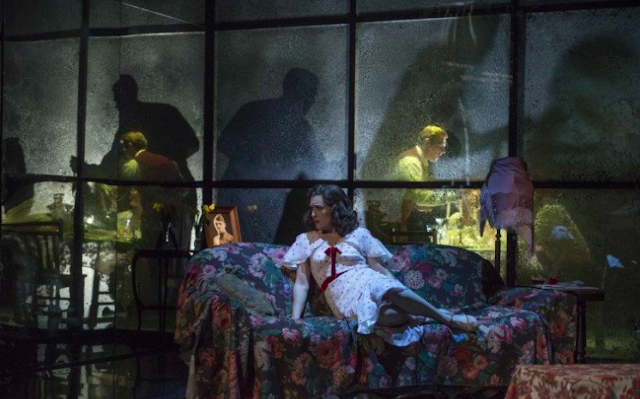 Indeed, there are many poignant moments in the Rep's Glass Menagerie. This story and these performances stick with you. Though I'm curious now to see other versions of the Tennessee William's classic, the Rep set the bar insanely high. This was an unforgettable night of theater and one that any company of players will be hard pressed to top. 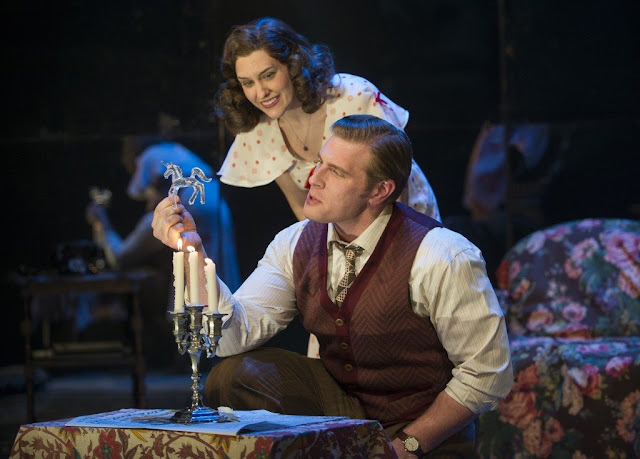 The Glass Menagerie is playing at the Milwaukee Repertory Theater now through April 9th. Info and tickets at milwaukeerep.com. Milwaukee sure is changing. Places that used to be favorites (favorite shops, favorite restaurants) have closed their doors at what feels like a moment's notice. The trade off, sometimes, is new spots to explore — new favorites in the making. That's how I feel about Mod Gen's new location in the Third Ward. Mod Gen calls itself "a modern take on the classic general store." Now located in the thick of the Third Ward, previously in Shorewood, the shop has some of the most unique offerings I've seen in a Milwaukee boutique. While a lot of MKE and Wisconsin love overlaps at shops like Waxwing and Sparrow Collective (and it's awesome! ), Mod Gen brings its own fresh vibe to Milwaukee's boutique scene. For starters, gardening sits front and center. Yes, a shop in the proverbial concrete jungle, boasting a green thumb — and encouraging yours. A little research taught me that Mod Gen has been around for about 15 years, primarily as a garden store until 2014. That's when they made some changes: a general store with a twist. Though I had lived within walking distance to Mod Gen's former Shorewood location for about two years, I'd never ventured in — a fail on my part. I have to say, especially since I'm a testament to it: I bet the Third Ward location is going to result in exponential buzz about Mod Gen's singular blend of nostalgia, contemporary, local products, and global goodies. Like their website says: "It's about life’s simple pleasures; a well made bar of soap, a garden tool that fits your hand just right, or that classic ice cream scoop like the one your grandmother had." Now aren't you just itching to shop there? 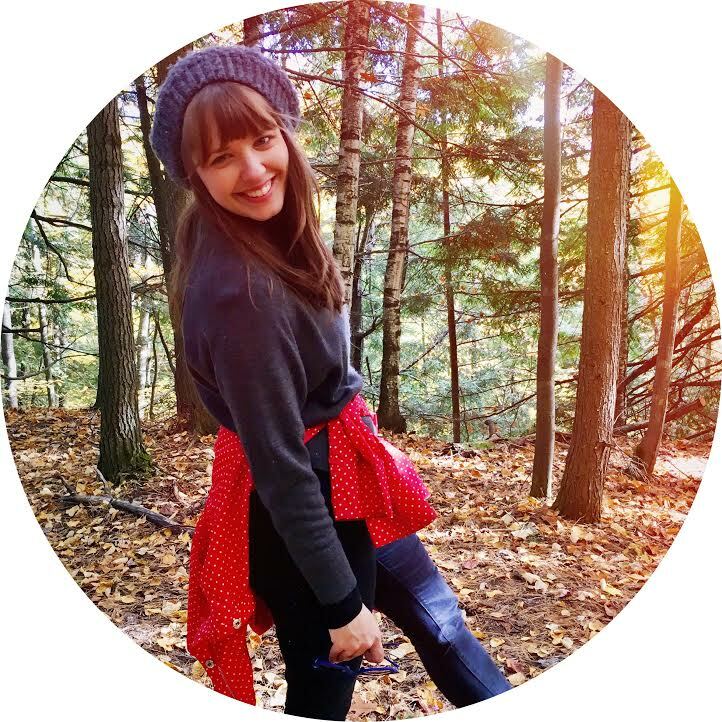 *Friends, do you know of other local boutiques I should add to my Milwaukee-area bucket list? Tell me in the comments! The Milwaukee Rep presents "Grounded"
The story of a drone pilot in search of "the blue"
The Milwaukee Rep has a knack for bringing timely, thought-provoking, and dialogue-starting stories to the stage. 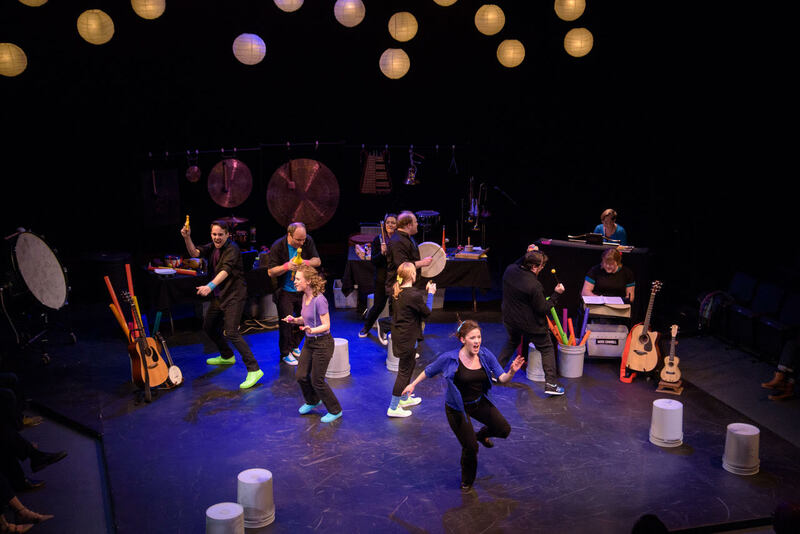 Grounded, playing now through April 2nd in the Stiemke Studio, is no exception. It’s a one-woman show, starring the incredible Jessie Fisher, and tells the story of an ace fighter pilot who’s career is grounded following an unexpected pregnancy. When she’s back and ready for duty, our pilot is relegated to the “chair force” — flying drones and dropping bombs in Afghanistan from the comfort of a trailer in Las Vegas. Drone warfare is something I personally haven’t given much thought — what the reality of it entails or what it means for those doing the fighting. At its very base level, Grounded certainly opened my eyes to modern warfare and how technology is both friend and foe. Although there’s half a world between our drone pilots and their targets, high-tech cameras mean you can actually make out figures and features, so the attack might, strangely, feel even more personal. On the flip side, you could argue that this technology allows our fighters to be more disconnected. Targets are just shapes on a screen, and at the end of a long day, our grounded troops are able to go home to their families and enjoy some semblance of normalcy. But as we see in Grounded, that normalcy can unravel you. Our pilot grapples with the dichotomy of targeting terrorists by day and tucking her daughter into bed at night. When she was up in the sky, she was able to get lost in “the blue” — something she loves and longs for, now that her world is a grey trailer in the Las Vegas desert and not the exhilarating, endless sky. Of course our Grounded pilot took great pride in flying and fighting for our nation as an airborne assailant, but it was her love of the blue kept her going day in and day out. Take that blue away from her, and eventually we find that shooting bad guys on a screen will drive you mad. It was the blue that inspired our pilot and, seemingly, maintained her sanity. Grounded’s 75-minute run time is manned solely by Jessie Fisher. There’s no intermission, but you won’t miss it. Fisher’s performance is so absorbing, starting off conversational, likable, relatable, and often laugh-out-loud funny — eventually taking us to the edge of our seat. As we see her descend in a tailspin of neurotic doubt, panic, and fear, Fisher seamlessly invites us along for the ride. It’s such performances that allow an already-remarkable play to realize its full potential, for really everything rides on that one actor. Grounded is worth a trip even for Fisher alone. Her character's fate aside, Fisher takes us out of the grey and into the blue, and that is an exhilarating experience. Grounded in playing now through April 2nd at the Milwaukee Rep. Information and tickets at milwaukeerep.com. If you love coconut and Thai flavors, this soup is for you. I knew I wanted to make a Thai-inspired coconut curry chicken soup. So I took a spin around google and pinterest and didn't quite find a recipe that spoke to me. Some called for rotisserie chicken, others chickpeas and diced tomatoes. I did a little bit of this, a little bit of that, until I came up with an easy, but hearty, recipe. *To double the recipe: Double everything (though when I doubled it, I still just used one rotisserie chicken — your call on that one). You can supplement regular coconut milk for canned, if desired. A doubled recipe will make a LOT of soup — I'd start with a single batch. 1. In a heavy-bottomed pot, sautée chopped onion and red pepper in 1 TBS oil. Season generously with salt and pepper. Cook until the veggies are soft, about 10 minutes. 2. Add minced/chopped garlic and ginger. Cook for about one minute, then add drained chickpeas, diced tomatoes, and curry paste. Season generously with salt and pepper again and stir to combine. 3. Add 2 cups chicken broth, 1 can coconut milk, and the solid coconut from a second can (or 2 cans worth of regular liquid coconut milk). Add 1/2 to 2 TBS sugar and stir to combine. *Note: The amount of sugar you need will depend on the type of coconut milk you use. Canned is less sweet than regular liquid coconut milk, and unsweetened liquid coconut milk is, of course, less sweet than regular. Start with a little sugar — you can always add more. 4. Add chopped chicken and kale. Simmer until the entire pot is bubbling and heated through. Add additional shakes of salt and pepper, and if you're craving more heat and flavor, shake in some extra curry. Serve immediately or store overnight (recommended). I find this soup gets better as the flavors mingle. So, ideally, make it the day before you plan to eat it. Don't forget that if it's lacking a certain zing, add some extra salt, pepper, and curry. The soup will keep for a good week — at least, I was eating a week later and lived to tell the tale. So all you Thai- and coconut-loving people, give it a whirl! This one doesn't disappoint. It's been over a week since my high school girlfriends and I got back from Tulum, Mexico. I've slowly been sifting through photos and jotting down everything I can think of that might help other travelers make the most of their stay in Tulum — from a broad overview, to logistics and itinerary, to exactly where we ate and drank. All that's left is to share some details on sights to see and things to do. 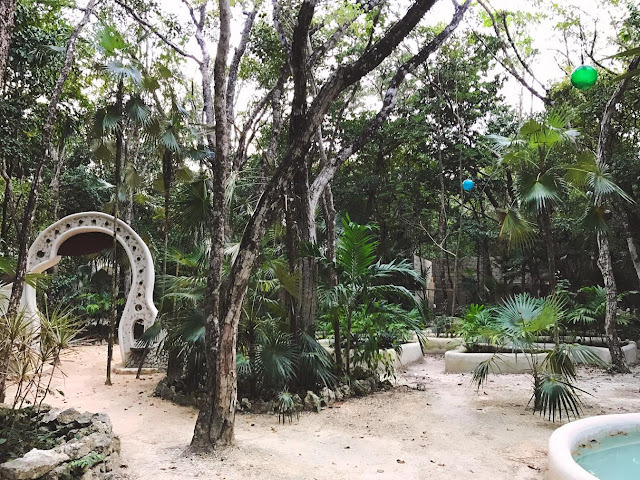 Holistika is a mind-body retreat center located on a stretch of jungled land, about 5 minutes outside of downtown Tulum and about 15 minutes from the beach. We stumbled upon this oasis because our airbnb happened to be within walking distance, but it would be worth a drive if you're especially into any of the following: yoga, temazcal (traditional Mexican steam bath), contemporary dance, meditation, sound healing, or laughing practice (yep). Truly, just take a spin around the Holistika website and see what speaks to you. 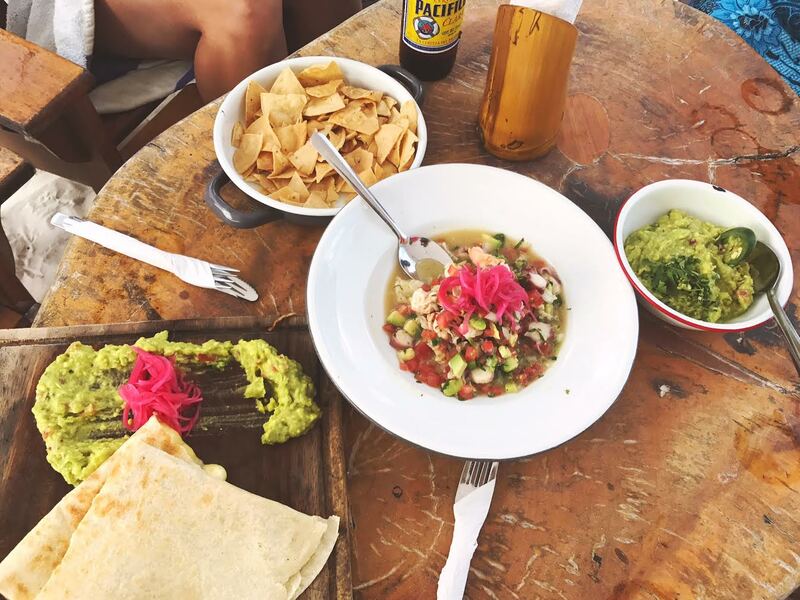 There are two main areas to hang out in Tulum: downtown and the beach strip. The beach strip is a long, narrow road lined with bars and restaurants — jungle on one side, beach on the other. While you know there are beaches everywhere, it can be overwhelming — with so much coast to pick from, where do you start? I started with a google search, which led me to Playa Paraiso. It was perfect. Surprisingly not at all over-crowded, even on a Saturday at midday. Bring your beach towels, as the fancy beach chairs and beds are reserved for hotel guests. Bring your appetite, because you can pause at any number of beachside cafés for drinks and apps whenever you're craving some shade. Ahh the Mayan Ruins. This was an experience. One we actually found to be a little anti-climactic. 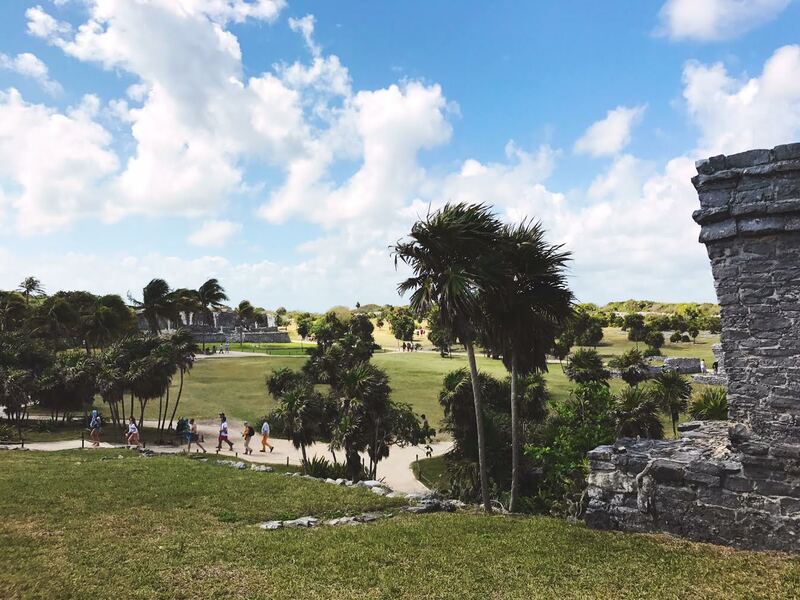 You can choose to do either the Tulum Ruins or the Mayan ruins at Sian Ka'an. We did the Tulum Ruins and found them to be super touristy. You enter the ruins complex through a maze of souvenir shops and costumed performers vying for photo ops. The resident tour company tries to sell you on taking their train from the main gate to the ruins (it's a short half-mile walk and their "train" is actually a tram car). Once you reach the ruins, it's crowded, there's hardly any shade, and swarming with people taking selfies. The ruins are roped off, save for some walkways, looming at a fair distance. It's cool to see, don't get me wrong, but I never felt overwhelmed by the majesty of history — which is kind what you want to happen, right? On the plus side, the Tulum Ruins end with a walk down to a beautiful beach, so we cooled off in the water and lounged around for a while after the our vague disappointment in the ruins themselves. As for the Mayan ruins at Sian Ka'an, I can't speak from experience, but there is apparently jungle hiking, river floating, snorkeling, etc., in addition to the ruins. My friends and I left the Tulum Ruins wondering if we should have gone to Sian Ka'an instead. A cenote is a natural, cave-dwelling swimming hole — and there are a handful to pick from in and around Tulum. The ones we considered were Gran Cenote, Ik-Kil, and Dos Ojos. 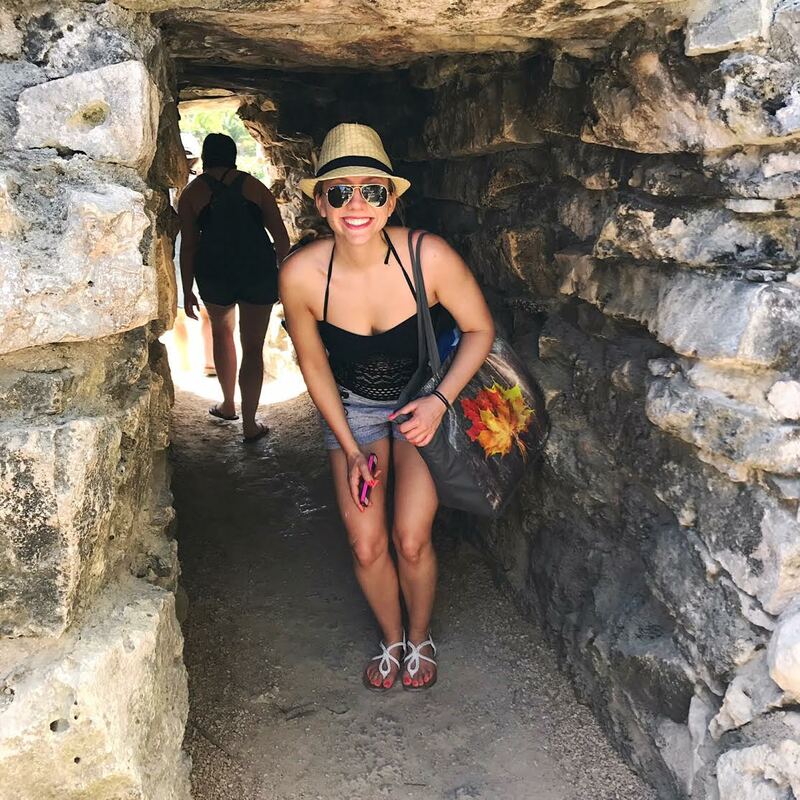 We learned that Gran Cenote is very popular with families, as it has shallow areas for kids and is located under 10 minutes from downtown Tulum. Though it looks beautiful, we avoided it due to its popularity. Ik-Kil would probably have been our top choice, had it not been located almost two hours from Tulum. This blogger does a great job detailing these two cenotes. We ended up going with Dos Ojos, located a half-hour from downtown. We hoped it would be a little less crowded, and we liked that there were two pools to swim in. You can also snorkel and dive here, but we chose only to swim and had a blast doing just that. When you're ready to get out of the chilly water, there are hammocks for lounging beneath the jungle canopy. A truly delightful way to spend an afternoon!